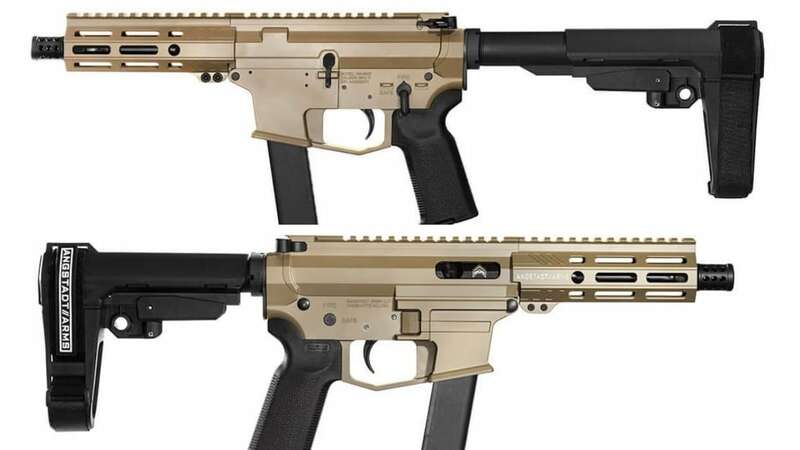 North Carolina’s Angstadt Arms last week announced they have grown their UDP-9 braced pistol line to include Flat Dark Earth. The new variant, standard with an SB Tactical SBA3 stabilizing brace, is finished in Magpul FDE Cerakote (H-267Q) on both the 7075-T6 billet aluminum receiver and handguard. Like its all-black predecessor, the 9mm includes a 6-inch threaded barrel, Magpul K2 pistol grip, and 22-inch overall length. The mag well is set up for all Glock 9mm doubles and the gun weighs just under 5 pounds. MSRP is $1,445. The SBA3 pistol stabilizing brace, shown here extended, has five adjustable lengths of pull settings and an integral, ambi QD sling socket. For Guns.com’s Ben Brown’s recent review on the UDP-9, which he calls “an excellent option for a new shooter or someone looking to get into some competitive shooting scenes,” check out the below.